Geos is one of the three on-site multiplayer games and resembles a modified version of Battleships. You can play for fun or practice against other players, but to be eligible for a trophy and a 10,000 Neopoints reward you must join the monthly tournament. There are four shapes to make and you can place them onto the board in any orientation. You can only place one piece at a time though, so while making your shapes it's best to focus on one at a time. Your objective is to create your four shapes before your opponent does. According to the Neopets Geos instructions, it says you can choose whether to "bomb" your opponent or build your own shapes. The catch here is that your opponent's pieces are hidden until the end of the game. You should always try to make building your shapes the priority, unless you fall behind due to missing a turn or being bombed. 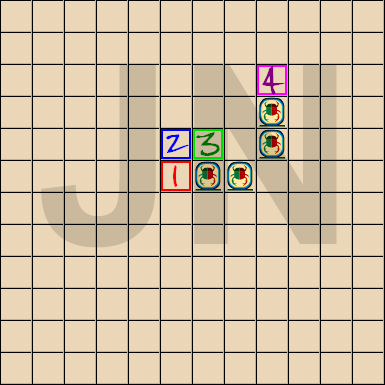 To make a move, use your mouse to hover over the play area and click on a square in the grid to place your piece. After you complete your first shape, you will notice (as seen in the above screen shot) that the shape's pieces become faded. This means that if your opponent tries to put their piece where one of your completed shape pieces are, it will cause them to lose a turn. 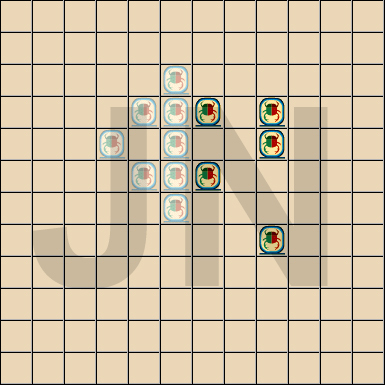 Another thing to keep in mind when making your shapes; try to place pieces in a way that, should you hit a completed shape belonging to your opponent (or you get bombed), you can modify the pieces to form another shape. In the below example, let's say I was making a rectangle and went to place my next move on the spot marked as (1), only to find it was a completed shape piece belonging to my opponent. I could modify this placement in several ways. I could make my next piece in (2) to start a circle, or place it in (3) or (4) to make a square or a rectangle in the opposite direction. When you hit an opponent's piece, one of two things could happen. If the piece you hit belongs to a set (otherwise referred to as a completed shape) this causes you to miss your current turn. 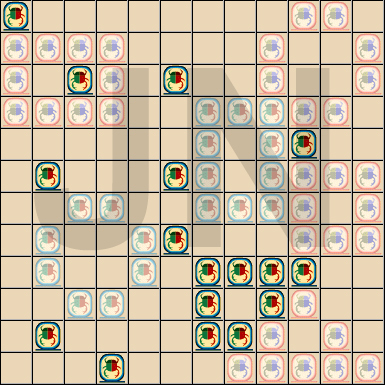 If you hit an incomplete piece, it destroys your opponent's piece and allows you to find another place to put yours (or if you want, in the same place you just bombed). This is called bombing and is a useful strategy, if it works. This strategy should only be used if you fall behind in making shapes, or if a situation arises where you run into your opponents shape by accident. If you do find yourself a shape or two behind, you can perform a systematic search for your opponent's shape-in-the-making (as seen below). As you can see, by placing your moves in a pattern you have a chance of running into and bombing any progress of your opponent. Be sure to continue your own shapes once you have located their shapes, since bombing alone will not win the game. This strategy relies heavily on luck and does not always work. The game ends when one player completes all four of their shapes. 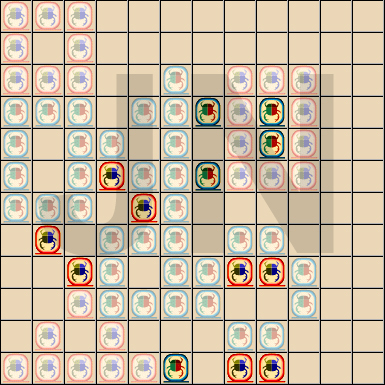 Once the last move is made, all pieces are displayed for both players.